Alpenglow Expeditions is back in Bolivia for our annual expedition to climb three different peaks. Every year we head down to the landlocked country to explore it’s incredibly deep culture and of course to climb peaks that hold almost surreal beauty and adventure within them. Out of our South American expeditions, Bolivia is still one of the more wild places we explore filled with a unique culture and history all it’s own. Early Sunday morning (July 29) the team led by Topo Mena left La Paz in their rear view mirror headed towards the mountains. 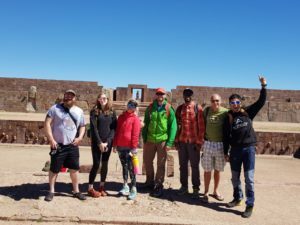 Along the way they visited the pre-Columbian archeological site in Tiwanaku before taking in lunch. 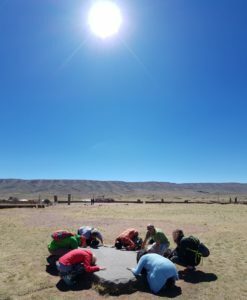 In Tiwanaku the team explored the site and in typical cultural fashion they took in energy from the sun for their upcoming climbs. After taking on some calories they continued their journey towards Copacabana (no, not the beach from the famous song) where they would spend the night before getting back on the road. 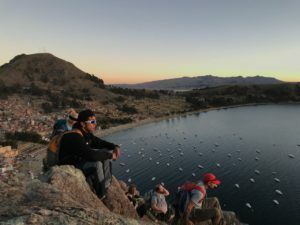 The next morning on Monday (July 30) the team took a 40 boat ride from Copacabana across Lake Titicaca to the Island of the Sun. The purpose here is two fold – 1. To have a great day of adventure and 2. get in some acclimatization. The island’s highest point stands at 13,450′ / 4100m. At the top of the island peak the team asked for permission from the mountains to climb safely with a Ch’alla celebration led by our local guide. The celebration is directed to Achachilas and Awichas, the male and female ancestors that live in the mountains. The island adventure ended with lunch on the shore of the lake. Later that same afternoon the team hiked for an hour on a peak in Copacabana to 13,615′ / 4150m to watch the sunset. What a day! Today (Tuesday, July 31) the team left Copacabana at around 10am to drive to the Condoriri trailhead. They arrived safely and are tucked in for the night. Topo reports that team vibes are good. Everyone is happy and excited to be headed to the mountains! Follow along on Instagram and Facebook for additional updates. For more information on our Bolivia expedition, or any of our other international expeditions check out our website. For any questions call our office at 877-873-5376 or send us an email info@alpenglowexpeditions.com. We hope to climb with you soon!